Rejoined the Saints from Stevenage Borough on a three-month loan deal early in September having moved to Broadhall Way from Clarence Park in January 2007. An outstanding right back who can fill a number of positions. Formerly a youngster with Norwich City he has had trials with Wycombe Wanderers, Cheltenham Town and Bournemouth; also had a brief spell with Redbridge. 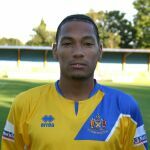 His St Albans City debut came in front of 6,190 spectators during a Conference National match at Oxford United on September 1st 2006.